BTB Runway Walk – Competitors walk to centre stage individually and down BTB runway to perform front pose and back pose. She will then turn around to walk back to her asigned position on BTB stage for the comparison round. Front pose – right hand on hip, left leg slightly to the side, left arm down, open hand, finger tips pointing out or straight down. Back pose – left hand on hip, right leg slightly to the side, right arm down, open hand, finger tips pointing out or straight down. Sweep hair to the side off the shoulders, body must be straight (no bending over). Competitors will proceed to the comparison round in groups of 5 and will perform front and back pose as directed. Front pose: competitors will stand with one hand resting on the hip and one leg slightly moved to the side. Quarter turn right: competitors will perform the first quarter turn to the right. They will stand left side to the judges, with upper body slightly turned toward the judges and face looking at the judges. Right hand resting on the right hip, left arm hold down and slightly back from the centerline of the body, feet placed freely but not together. Quarter turn back: competitors will perform the next quarter turn to the right and will stand back to the judges. They will stand straight, not leaning the upper body forward with one hand resting on the hip and one leg slightly moved to the side. Second hand hanging down along the body, slightly to the side, with open palm. Quarter turn right: competitors will do the next quarter turn to the right and will stand their right side to the judges, with upper body slightly turned toward the judges and face looking at the judges. Left hand resting on the left hip, right arm hold down and slightly back from the centerline of the body, feet placed freely but not together. Quarter turn front: competitors will do the last quarter turn to the right and will perform front pose. BTB Bikini Athletes are expected to be healthy, fit, toned, symmetrical and aesthetically pleasing. 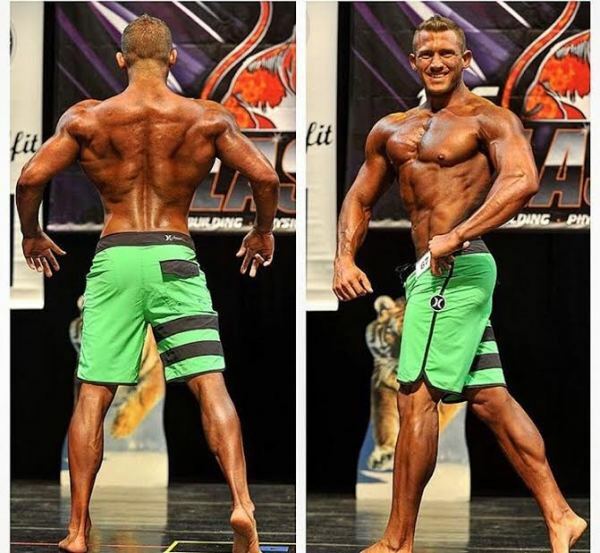 They should have an attractive athletic, fit physique shape and the "total package" from top of the head to toe and will be judged in this format. 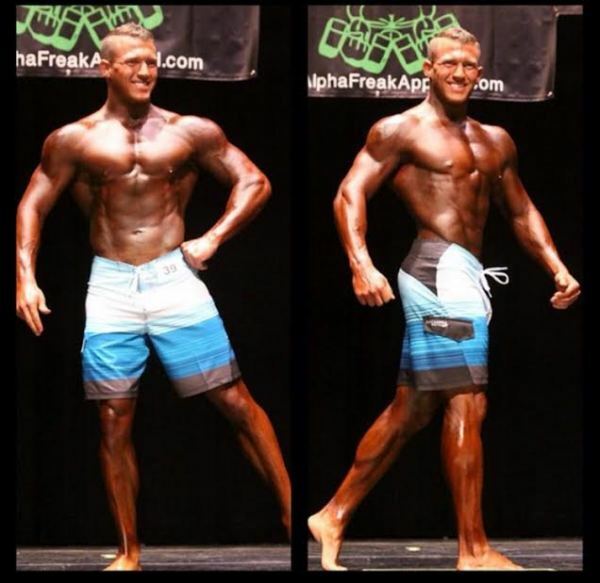 Competition tan is allowed and recommended. Front Pose- Facing the judges. Lat Spread, feet together, knees unlocked, arms are slightly away from the body, fingertips extended and pointing downwards. Side Pose- S Curve, feet pointed straight to the side, back hand is on the hip, both shoulders are facing the front, and the front arm is slightly rounded and extended downwards. Back Pose- Facing away from the Judges. Lat Spread, feet together, knees unlocked, arms are slightly away from the body, fingertips extended and pointing downwards. Competitors will perform the comparison round in groups of five (5) and complete the following four quarter turns: Quarter Turn Right, Quarter Turn Back, Quarter Turn Right, Quarter Turn Front. Judges will have the opportunity to compare athletes against one another in quarter turns. BTB Runway Walk – Competitors walk to centre stage individually and down BTB runway to perform front pose and back pose. He will then turn around to walk back to his asigned position on the BTB stage for the comparison round. Judges will have the opportunity to compare competitors against each other in quarter turns. BTB Runway Walk – Competitors walk to centre stage individually and down BTB runway to perform a mandatory pose of choice. He will then turn around to walk back to his asigned position on the BTB stage for the comparison round.